The "Father of the Green Revolution in India", Professor M. S. Swaminathan is to hold a guest lecture at UMB on 5 February. On 5 February renown Professor M. S. Swaminathan is paying a rare visit to UMB and will give a guest lecture on "Sustainable Food Security in An Era of Climate Change". The lecture take place in the Tower building (T330) at 12:15 hours. Third Cross Street, Taramani Institutional Area. Professor M S Swaminathan has been acclaimed by the TIME magazine as one of the twenty most influential Asians of the 20th century and one of the only three from India, the other two being Mahatma Gandhi and Rabindranath Tagore. He has been described by the United Nations Environment Programme as "the Father of Economic Ecology" because of his leadership of the ever-green revolution movement in agriculture and by Javier Perez de Cuellar, Secretary General of the United Nations, as "a living legend who will go into the annals of history as a world scientist of rare distinction". Swaminathan served as Chairman of the Brundtland Commission’s Committee on Food Security and Forestry. His report has been published by Zed Press under the title, “Food 2000”. He also served as President of the World Conservation Union (IUCN) and the Pugwash Conferences on Science and World Affairs. Further, he served as Chairman of the International Commission on Peace and Food. 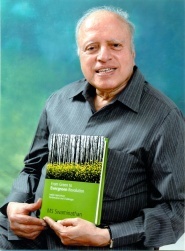 Professor Swaminathan is a Fellow of many of the leading scientific academies of India and the world, including the Royal Society of London and the U S National Academy of Sciences. He has received 66 honorary doctorate degrees from universities around the world. He currently holds the UNESCO Chair in Ecotechnology at the M S Swaminathan Research Foundation in Chennai (Madras), India. He is a Member of the Parliament of India (Rajya Sabha), to which position he was nominated by the Government of India in May 2007 in recognition of his contributions in the field of agricultural research and development. He also chairs the High Level Panel of Experts (HLPE) for the World Committee on Food Security.